Custom Tanks are required for unique problems. In most cases, custom tanks are commissioned when there is a need to find a solution to an existing problem, or there are unusually strict constraints of time and/or money. Most organisations look for custom tanks in situations where a storage solution is required fast and possibly for unsafe materials. In other cases, custom tanks are required to bring down production costs and finding environmentally and financially sustainable models of production. Organisations discuss the kind of storage requirement that needs to be addressed with the team at ModuTanks, which then comes up with the best possible solution. The solution is based along multiple parameters, including, capacity, material to be stored, durability and location. Here are some instances where these parameters necessitated the designing of a custom tank. When running a big project, like that of construction and manufacturing, often times, storage needs come up during the operational cycle. Since these needs were not envisaged beforehand, there is no designated layout or location for the tank. For instance, in one of our projects, we were faced with plants generating hazardous by-products. We were supposed to provide an effective storage solution in a narrow corridor space within a very tight deadline. So, by using modular panels, we installed a form fitting ModuTank which was lined with HDPE. The tank was able to occupy the constrained space and was secure enough to handle the storage material. Sometimes, custom tanks are required for short term solutions for problems that are threatening the local ecosystem. In such a situation, the design of the tank becomes as important as the speed of its delivery. When sludge generated from a coal liquefaction project was letting off hydrocarbons, the danger to the local ground water was imminent. If not contained immediately, the situation could create a serious health hazard for the local community. Therefore, two ModuTanks, with a combined capacity of 330,000 gallons were installed. Their usage was continued even after the danger was averted because of the speed of their installation and their easy disassembly which made them useful for future projects as well. 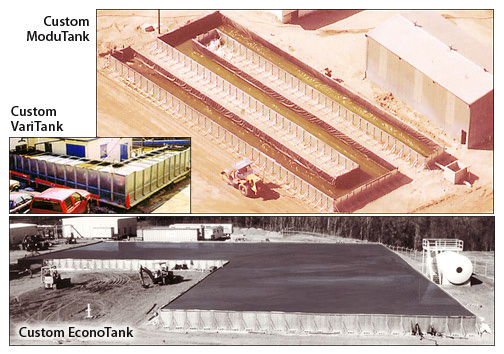 One of the most common reasons for ordering custom tanks is the need to integrate these tanks to existing technology and create self-sustaining plants of a kind. So for example, when we were asked to create a solution for drilling mud storage in an oil-rig, we suggested 3 tanks of different capacities. The used drill mud was routed from the largest tank to the next, which is embedded with the latest drill mud purification technology. The final product was re-usable drill mud and was stored in the smallest of the 3 tanks. Such a solution, is not only pragmatic, it is also extremely cost effective. Additionally, the innovativeness of the design helps keep the rig under EPA guidelines and contributes to cleaner and greener solutions. Custom tanks, therefore, are a good idea if you are looking for solutions that fit your needs and not the other way around.